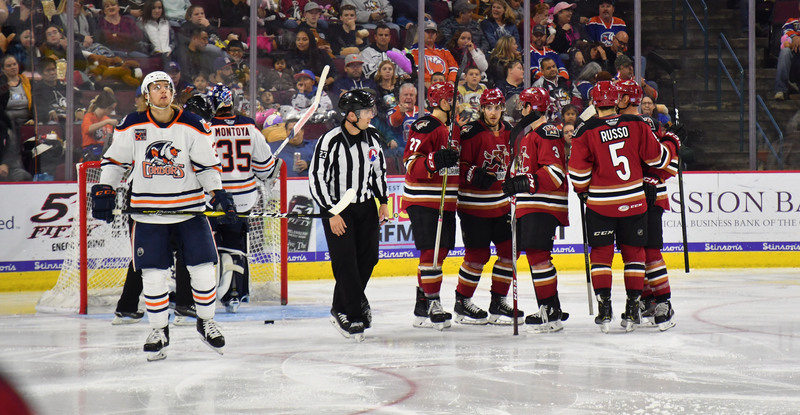 Any way you cut it, the Roadrunners couldn’t have started off their road trip in better fashion, the team steamrolling the Bakersfield Condors by way of a 6-1 victory Saturday night at Rabobank Arena. An offensively dominating performance was welcomed for more than just the goals themselves, but to provide security to goaltender Hunter Miska, who was making his first start in 21 days. “[Miska] helped us out there huge at the start of the game, kept [Bakersfield] scoreless for a while and definitely gave us some momentum early,” Adam Helewka said. 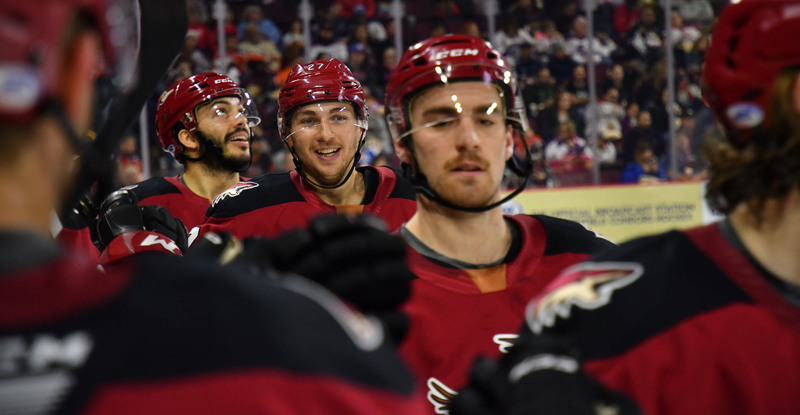 Miska, who returned from the Arizona Coyotes on assignment Friday, had seen just 18 minutes of live action since his last Roadrunners appearance on November 3, but had plenty of support Saturday to go complement his impressive 28-of-29 performance. Brayden Burke scored the game’s lone first period goal just under eight minutes into the contest when he beat Bakersfield’s Al Montoya with a wrist-shot on a fast break three-on-one sequence. To begin the second, the Roadrunners shattered a team record that was set on Wednesday, scoring three goals in a 2:08 span, topping the mark of 2:39 earlier in the week. First up was Mario Kempe, who gave the Roadrunners a 2-0 lead when he redirected a Jordan Gross shot past Montoya 25 seconds into the second period, netting his fourth of the season. Soon thereafter, Hudson Fasching caught the eye of Laurent Dauphin while straying behind Bakersfield coverage, received a pass, and walked in alone to score his fifth of the season, giving the Roadrunners a 3-0 lead. Less than a minute later, Brayden Burke connected for his second goal of the night when he slammed a Kyle Capobianco cross-feed past Montoya on yet another three-on-one rush, giving the Roadrunners a commanding 4-0 lead. After a bit of downtime, Trevor Murphy teed-up from the left point following an offensive zone faceoff draw, wiring his fifth goal of the year to the top right corner to up the Roadrunners’ lead to 5-0. The Condors would break in as Joe Gambardella got Bakersfield on the board with 7:34 to play in the second, making it 5-1. In the waning moments of the second, Robbie Russo, from behind the goal-line, banked a puck off the back of Shane Starrett – who earlier came in for relief of Montoya. Russo’s puck trickled on the goal-line until Matteo Gennaro broke through to swat the puck into the net, giving the Roadrunners a 6-1 lead at period’s end. The Roadrunners scored five goals in the second period, the first time in franchise history they’ve netted five in a single frame. Neither team found the back of the net in the third. Five players registered multi-point games: Robbie Russo (2A), Laurent Dauphin (2A), Hudson Fasching (1G, 1A), Adam Helewka (2A), and Brayden Burke (2G). The Roadrunners now travel for the second-half of their two-game-in-two-day weekend to take on the Ontario Reign Sunday afternoon at Citizens Business Bank Arena, where the puck is scheduled to drop just after 4:00 PM PST.